Enjoy exceptional ambiance and quality service as well as delicious meals for your next banquet or catering gig. Uncomparable Italian cuisine including dishes such as Ravioli, Gnocchi, Chippino Italian Stew and so much more...raving reviews entice you...the food will make you come back! Your dinner is not finished until you taste one of our signature desserts. Enjoy amazing dishes like the Veal Chops! 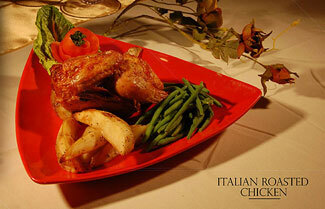 Serving Delicious Italian food in Chicago South Suburbs and Northwest Indiana. The Scrementi Family has been cooking HOMEMADE ITALIAN RECIPES in the South Suburbs of Chicago for over 50 years. All of our food is PREPARED FRESH in our kitchen EVERYDAY! We feature many specialty dishes, like Ravioli, Gnocchi, La Trippa in gravy, Italian Giblets, Italian greens, and tantalizing pasta and chicken dishes. Enjoy cozy fireside seating in our dining room. Also, don't forget to stop by our fully stocked bar before or after dining when you come visit. So come sit, share family memories, and enjoy some of the best Italtian food in the South Suburbs of Chicago. Also serving Northwest Indiana! Scrementi's Restaurant, located in Steger, Illinois, a suburb of Chicago, has a feel all its own. Seating Capacity 125 with Dance Floor.